The military-political landscape in Europe and the Mediterranean is changing. NATO is not as unified as it once was, and Turkey’s membership has become more of a formality than a real thing. A pro-US group consisting of Great Britain, Poland, and the Baltic States has emerged as part of a North Atlantic Alliance that is divided by differences and the open rift over the 2% financial contribution, a decree that is largely ignored, along with the other divisions that are weakening the bloc. Other groups are arising that also have common security interests. A new pact, an Arab NATO allied with the United States, will soon materialize in the Middle East. Changes are coming, but they are hard to predict as everything is currently in a state of flux. “The United States is interested in increasing its use of military bases and ports in Greece,” said General Joseph Dunford, the Chairman of the US Joint Chiefs of Staff (CJCS), on Sept. 4 during his visit to Athens. “If you look at geography, and you look at current operations in Libya, and you look at current operations in Syria, you look at potential other operations in the eastern Mediterranean, the geography of Greece and the opportunities here are pretty significant,” he added. According to the Military Times, “[N]o specific bases have been identified, but that Supreme Allied Commander Europe Army Gen. Curtis Scaparrotti is evaluating several options for increased US flight training, port calls to do forward-based ship repairs and additional multilateral exercises.” US Commerce Secretary Wilbur Ross came to Greece right after the CJCS’s visit to take part in the annual Thessaloniki International Trade Fair. Washington’s relations with Ankara continue to deteriorate. The idea of expelling Turkey from NATO is being discussed in the most prestigious American media outlets. The view that Ankara is more of an adversary than an ally is commonly held among American pundits. General Dunford pointedly did not include Turkey on his itinerary, as top US military officials would normally do in order to maintain balance in their relationship with Athens and Ankara. This is a clear message to Turkey. It was reported in May that the US military had started to operate MQ-9 aerial vehicles out of Greece’s Larissa military base. That same month, the USS Harry S. Truman aircraft carrier was one of the American ships making a port call. 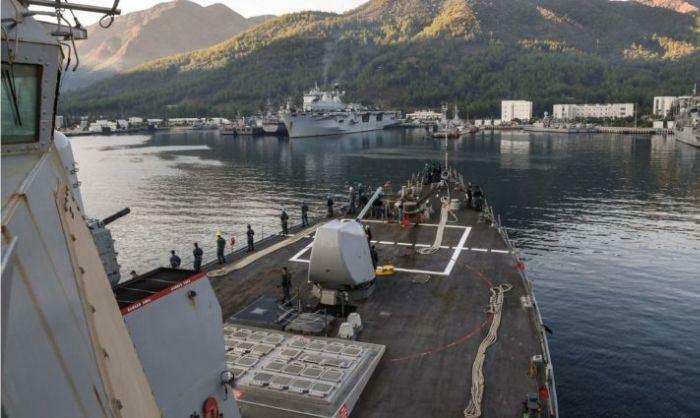 Greece’s Souda Bay naval base is being used to support US operations in Syria. US Ambassador to Greece Geoffrey Pyatt has often cited the strategic significance of the ports of Alexandroupolis and Thessaloniki. Washington is interested in helping the Greek military conduct more effective operations in the Aegean and the Mediterranean. Greece is a crucial element in dealing with the challenges of the Eastern Med, the Maghreb, the Balkans, and the Black Sea region. There can be no doubt that Ankara’s dispute with Cyprus and Israel over drilling rights in the Mediterranean was also on the agenda of the talks during Gen. Dunford’s visit, although no comments were made to the media in regard to this issue. Greece wants to transform Alexandroupoli into a hub for the gas being exported from Israel and Cyprus to Europe. The pipeline’s approximate length is between 1,300 to 2,000 kilometers, and it will begin in Israel and cross through the territories of Cyprus, Crete and Greece to eventually end in Italy. The hub will also have a rail link to Bulgaria. A floating LNG reception, storage, and regasification unit will be part of this project, to make it possible to bring in US LNG supplies. The planned route of the EastMed pipeline, a project supported by the EU, will bypass Turkey, despite the increased cost. Ankara will hardly sit idly by and watch this turn of events. Turkey claims that part of the exclusive economic zone of Cyprus is under Turkish jurisdiction. According to Turkey’s President Erdogan, the “Eastern Mediterranean faces a security threat should Cyprus continue its unilateral operations of offshore oil and gas exploration in the region.” The countries involved in the project may need US protection and help in order for this to come to fruition. A year ago the US opened its first permanent military base in Israel run by the US military's European Command (EUCOM). Officially, the primary mission of the air-defense facility located inside the Israeli Air Force's Mashabim air base, west of the towns of Dimona and Yerucham, is to detect and warn of a possible ballistic missile attack from Iran. This is part of a broader process as a new military alliance with its own infrastructure emerges. In 2015, Greece and Israel signed a military cooperation agreement. Bilateral and trilateral military drills, such as Nobel Dina, a multinational joint air and sea exercise conducted under the partnership of Greece, Israel, and the United States, have become routine. In March 2014, Israel opened a new military attaché office in Greece to signify this ever-closer relationship. Israel has a strong defense and military relationship with Cyprus. The three nations are pledging deeper military ties, in keeping with the declaration they issued at the first-ever trilateral defense summit last year. Both Greece and Cyprus are EU members and Israel needs allies within the bloc. Greece opposed the EU’s decision to label products from Israel’s settlements. In May, the leaders of the three allied Eastern Mediterranean nations paid a joint visit to Washington. Albania, Greece’s neighbor, has recently offered to establish a US military base on its soil. Albania's defense minister, Olta Xhacka, made the proposal in April during her visit to Washington. Of all the members of the emerging alliance, only Israel is not a NATO member, but it’s an enhanced partner and a member of the Mediterranean Dialogue. What we actually have is a new alliance within the alliance, which was unofficially established to counter Turkey, a full-fledged NATO member. Under the circumstances, it would only be natural for Ankara to distance itself from NATO to move toward Russia, Iran, China, the SCO, and, perhaps, the Eurasian Union. The alliance of the US and the three Eastern Mediterranean states has emerged as a political and military “petite entente,” a force to be reckoned with at a time when NATO is facing serious challenges to its unity and the EU’s future is in question. The two large entities that bring together nations sharing the same “values,” or the desire to counter China or Russia, are giving way to smaller groups of countries pursuing shared regional interests, thus undermining the very concept of what is known as the United West.